Hi, babes! I am so excited to share this travel guide today! 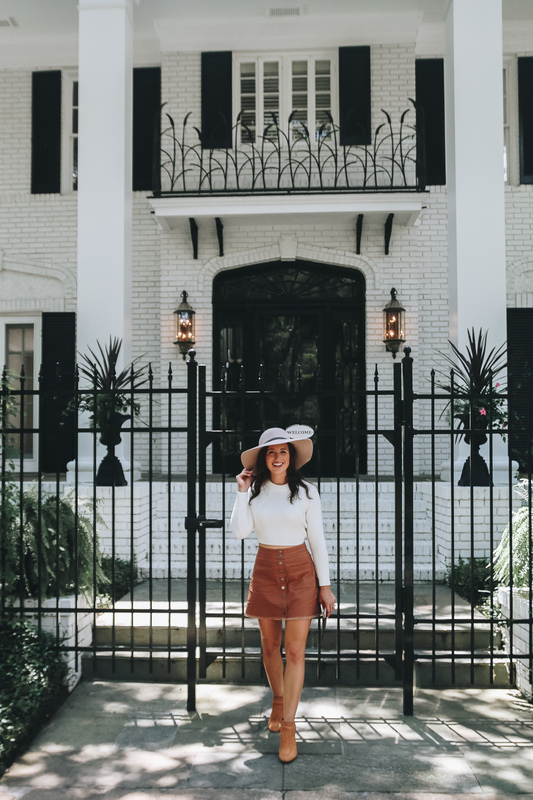 Savannah has been on my list of must-see destinations, and a few weeks ago I finally had the chance to stay and explore this charming Southern city! There’s nothing I love more than visiting the South and immersing myself in the culture-from the history to the food, it’s an experience that just feels like home. True Southern hospitality greets you– from the minute you stepped off the plane to the minute you head home, you are always welcomed with open arms. Did you know Savannah was once promoted as the “Hostess City of the South?” In my opinion, it’s the perfect descriptor of this city that defines Southern Charm! Another famous icon of Savannah is the Oak trees strung with Spanish moss-found in park squares throughout the city. These sweeping giants are carefully tended for preservation in Savannah’s 22 park squares-the most famous being Forsyth Park. Also nestled in and around the park squares you may find musicians, fountains, statues, and horse drawn carriages. Savannah lies on the Savannah River, most notable for it’s St Patrick’s Day celebration where the river is dyed green. The city of Savannah is also marked by its cobblestone streets and picturesque historic district. We arrived in Savannah well before 9am, and went straight to The Kimpton Brice Hotel to drop our bags before a day of exploring. The lobby of the hotel is one of the most chic and eclectic, yet inviting and homey, lobbies I’ve ever seen. Cozy seating areas, shelves of books, and a serene courtyard (the secret garden) offer the perfect setting for enjoying your morning coffee or evening cocktail. Speaking of coffee (and cocktails) the Kimpton Brice offers a full coffee/iced coffee bar every morning! As you all know I only drink iced coffee so this little extra detail was a big win for me! They also have a complimentary cocktail hour in the evening with wine and appetizers. We arrived well before 9am, but our room was ready-huge plus! The rooms are spacious with a huge living area with a TV and pullout couch. This extra room is ideal for a family and/or group! Between the living space and bedroom is a large closet and huge counter area. The counter and sink are separate from the shower area which again. The room overlooked one of our favorite Savannah icons, which is a large park filled with the infamous live oaks seemingly overseeing the city, and sweeping with Spanish moss. The Kimpton Brice hotel is located across the street from River Street and a little less than a mile from Forsyth Park and the historic district. All main destinations are easily walkable from the Brice Hotel. It’s also less than a $10 Uber/Lyft if it’s too hot to walk! The hotel also offer complimentary first-come, first-serve bikes available for exploring the city. If you want to take it easy, the pool area at the Kimpton Brice is a beautiful, light and bright patio area-it’s a little oasis right in downtown Savannah! After checking in to the Brice Hotel, it was time for our first Southern meal of the trip! Vic’s on the River was an easy choice! This award-winning restaurant has an expansive menu of traditional Southern fare. Our waitress walked us through their most famous dishes, and we couldn’t say no to her favorites. Ordering a few appetizers/dishes for table is the way to go for a light lunch. We tried the fried green tomatoes with goat cheese, tomato chutney and balsamic glaze and the spicy fried shrimp with Thai chili pepper and both were bursting with flavor! The shrimp had a little kick but wasn’t unbearably spicy! Cafe M Savannah is both the cutest and most delicious, authentic Parisian cafe I’ve visited. The quaint French decor and outdoor seating area offer the perfect setting for enjoying coffee, brunch, fresh-baked pastry, or a glass of wine. Croissants (with or without chocolate) are baked hourly-so they are always available and ready to enjoy! We had a tough time narrowing down what delicious items to try off the menu, so we tried a lot! The Veggie Quiche was outstanding-baked in a light, flakey crust, this traditional french quiche is a recipe from the owner’s grandmother’s recipe book! The chocolate croissant was served warm. An easy favorite! Thee macaroons were just as delicious. I was supposed to save them for later, but they didn’t make it back to the hotel! The lavender latte was the surprise of the meal for me. The latte was sweet and flavorful without being too strong. We also enjoyed the mint latte. Whether you stop in for a sweet treat, coffee, or brunch, Cafe M Savannah is top notch in both food and service. It is the perfect mix of an authentic French Cafe and welcoming Southern Hospitality. After a long travel day, we weren’t in the mood for a big dinner, so we went venturing for apps and drinks. Prohibition Savannah (there’s also a Charleston location) is the perfect choice to wind down and enjoy some savory apps and hand-crafted cocktail! I started with a Queen of Siam which was light and fruity with a little kick (I always go for cocktails with spice)! We ordered the Memphis Dry Rub Charred Wings and omg-they were bursting with flavor and fell off the bone! Extra gorgonzola ranch required! We also tried the Brussel sprouts with chili-lime sauce and pickled carrots, and the shrimp and grits. I am not usually a grits fan, but this dish with braised pork belly, cheddar mousse, and kale was amazing! Danger: you will not be able to stop thinking about Pralines after stopping in for a sample at River Street Sweets! There is no better way to describe the goodies from River Street Sweets other than “decadent.” Pop in for a praline sample (classic or chocolate), and I guarantee you will wander your way in to check out the rest of the delicious goodies. We stopped in every day (sometimes twice) to grab a sample and wander the shop! The shop employees are friendly and inviting, and it is fun to see them make the treats right in front of the shop. The bear claws and praline pecans were another favorite and just as indulgent as the pralines. I took a box of goodies home to enjoy, but it was hard not to eat them all in one sitting! Pro tip: pralines lose their freshness after a day or two, so wrap in a damp paper towel and pop in the microwave for 20 seconds! We kept hearing rumors that the beignets at Huey’s are a must-try. We popped in at lunchtime to see for ourselves! I was pleasantly surprised! Somewhere between a donut and a doughboy, the beignets were light and fluffy and covered in powdered sugar. For me, the more toppings/condiments/sauces, the better, so I enjoyed the praline dipping sauce that came with them. I can also see it being too sweet for someone that isn’t a big sweets person. Beignets are not something I would order regularly, but worth trying! While we didn’t have a chance to eat dinner at Pacci, we enjoyed a few cocktails at the bar! We also had breakfast there the morning before we left! Pacci’s is located right inside the Kimpton Brice so it makes for an easy choice to gather before heading out for the day/night. While en route to Wormsloe State Park, we drove by a free-standing Krispy Kreme. We immediately made our Uber driver pull over! There are no free standing Krispy Kreme shops in CT, so grabbing a fresh Krispy Kreme was a treat! By the way: I had NO idea how many flavors of Krispy Kreme exist! We didn’t get too creative and went with the original glazed! The Collins Quarter is the perfect casual dinner spot. The chic interior, fun cocktail menu, and casual yet innovative menu made for an easy dinner. We dined outside which was great for people-watching! I started with the cucumber-basil collins which was very refreshing. For a light dinner, the down under chicken sandwich with Australian BBQ sauce, avocado, and smoked gouda is a delicious choice! If I was more hungry that night, I definitely would have tried the Duck Confit! Broughton Street is the downtown shopping destination in Savannah! You’ll find some favorite national retailers such as Loft, Lululemon, and Urban Outfitters, along with many kitschy one-off boutiques. We spent over an hour wandering around Civvies, where I got totally sucked in to the color coordinated racks and promises of vintage finds. For all you Starbucks lovers-there’s a location on the corner of East Broughton and Bull Street! You’ve already heard about some of my favorite treats on River Street, but tucked among the restaurants are also cute little shops! You’re not necessarily going to find brand name merchandise in these shops, but you may come across some fun, affordable fashion finds or souvenir gear (if that’s your thing)! I found a really cute kimono and some designer dupe handbags in one of the shops Fine Things Under $20! The best way to enjoy downtown historic district? Wander around and soak it all in! Forsyth Park is surrounded by historic homes, so just taking a walk through and around the park will immerse you in the beauty of Savannah’s history! Forsyth Park is the home of the iconic Savannah fountain that I’m sure you’ve seen (or check it out featured on my IG/below)! Wormsloe Park is about a 10 minute drive from downtown Savannah. It’s a must see! This is where you can see the “Avenue of the oaks” which is a beautiful “tunnel” of Oak trees with Spanish moss. Weather: It is HOT in the summertime! I am all for walking as my means of exploring, but the afternoon heat is exhausting in the high summer! I would save your exploring for morning or late afternoon and spend the hot afternoon hours having lunch, hydrating, or at the pool. Walkability: River Street is built in to a hill. There are a lot of stairs and uneven ground. If you have someone elderly or handicap in your group, I suggest using an elevator in one of the hotels or restaurants to get down to River Street from East Bay Street (the main road). Transportation: Lyfts are cheaper than Uber by a few dollars! Also, petti cabs are expensive but a fun way to explore the city! Taking a petti cab ride around the city is an activity in itself! Fun fact: Savannah is 1 of 5 cities in the US (looked up that stat lol) where it is legal to drink on the street. There are some bars set up like coffee hops-aka grab your drink and go! Overall, Savannah is a fun and welcoming city to visit and explore! Savannah would be great for a girl’s trip, a weekend getaway, or a bachelorette party! Staying at the Kimpton Brice Hotel and enjoying the hospitality of Savannah was a great way to unwind, explore, eat, and shop in a new gorgeous location! This will definitely not be the last time I visit Savannah!